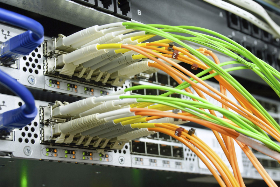 Our Fibre Optic cabling solutions draw on over 20 years experience in this field. Fibre optic cabling is a high-speed, high-security method of transferring data as it is impossible to detect the data that it carries remotely. Unlike its copper couterpart, fibre optic cable can transport data over large distances (making it ideal for netowrks spanning a number of buildings); and is resistant to lightning strikes. This is by far the most used cabling mode, and comes in two basic core sizes. OM3 50/125 micron offers greater distance transmission for Gigabit, up to 800m and is becoming more commonly used in comparison to 62.5/125 which will only drive up to 275m. Multimode has the advantage that it can be cheaply and easily field terminated and tested. Singlemode will run Gigabit for tens of kilometres and is really only governed by the drivers on the end. However, the media adapters are much more costly for this type of cable. Therefore Singlemode is generally used for metropolitan networks, but as BT own most of the ducts running through our roads, we do not install a great amount of Singlemode.